Eurostar has advised passengers not to travel to Paris unless absolutely necessary for the rest of the month of March. 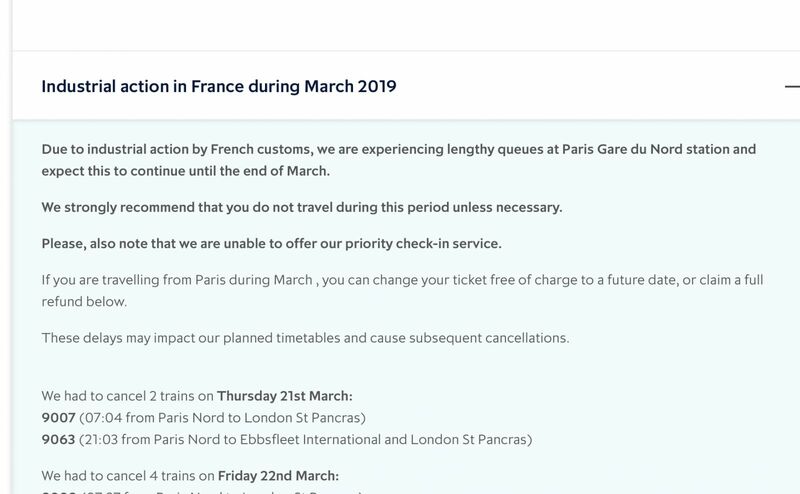 The company issued a statement saying: "Due to industrial action by French customs, we are experiencing lengthy queues at Paris Gare du Nord station and expect this to continue until the end of March. "We strongly recommend that you do not travel during this period unless necessary. "Please, also note that we are unable to offer our priority check-in service." Passengers have reported queues of up to six hours over recent days and several services a day between Paris and London have been cancelled. A work-to-rule protest began on March 4 and was originally scheduled to finish on March 20. It has now extended until at least March 24. Three services on the London-Paris route have been cancelled today, three more tomorrow and a further three over the weekend. Up to three services a day continue to be cancelled for next week. Eurostar reminded passengers: "Please be aware that availability is currently limited so your first choice of train may not be available."